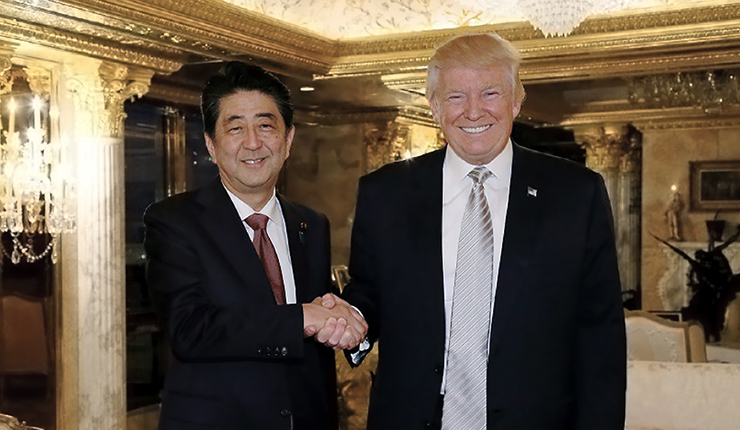 The meeting of Japanese Prime Minister Shinzō Abe and Donald Trump that took place on April 18 on the territory of the US President’s estate in Florida should be considered an important landmark of the complicated game that is currently going on in the Asia-Pacific (APAC), in which military and political factors are sophisticatedly intertwined with trade and economic ones. It is quite natural that the third leading regional player was invisibly present at the Mar-a-Lago (Donald Trump’s estate) negotiations – that is, China, because all regional strategic triangle (the US – China – Japan) processes on any of its sides reflect the presence of the third corner. On the eve of the meeting, commentators outlined 2 priority topics for discussion by the US and Japanese leaders: the military and political situation on the Korean peninsula and the prospects of bilateral trade and economic relations development. The importance of the first topic has to do with a fundamentally new game that is gaining ground around the “Korean issue”. It was sparkled by the North Korean leader’s speech on January 7, which suggested resuming the inter-Korean dialogue on the whole range of issues that had been separating two peoples that once used to be one for over 70 years. This call was met positively by the South Korean President. As though an invisible hand swept all the pieces from the Korean chessboard away (their positions were the result of the previous long years of playing) and put all the “black” and “white” pieces in their original places and moved the first “pawns” in a new game. These first “pawn” moves were high level delegation negotiations between North Korea and South Korea, which were hosted first by Seoul and then by Pyongyang. In both capitals, the negotiations went on to the cabinets of both Korean leaders. Then two heavy pieces joined the game, namely the US and China, which was the result of US President Donald Trump’s positive response to the North Korean leader Kim Jong-un’s initiative to conduct bilateral negotiations, as well the latter’s “secret” visit to Beijing. In the Chinese capital, Kim Jong-un received unequivocal support from the Chinese leader Xi Jinping. Currently, only Japan remains “out of the game” on the Korean peninsula, but it reasserts its position by continuous calls on Seoul and Washington to “reinforce the joint pressure on Pyongyang in order to force North Korean leadership to abandon its nuclear missile program (NMP)”. The evident blunder of the Japanese Prime Minister overlapped with another escalation of tension in the Japanese-South Korean relations brought on by the notorious “comfort women” problem and the Dogdo and Takeshima islands territorial dispute. Japan could not help feeling that its role in the affairs of the very important Korean peninsula was getting “marginalized”. Shinzō Abe wanted to use the meeting with Donald Trump to join the “Korean issue” political games that are underway, but it is obvious that this issue is beginning to expand beyond the limits of the “North Korean nuclear missile program problem” publicly outlined by Washington. However, the “secret” visit to Pyongyang by the CIA Director and possible new US Secretary of State Mike Pompeo, which took place during Shinzō Abe’s visit to the US, clearly showed Donald Trump’s intention to act on the Korean peninsula without taking his key regional partner into consideration. 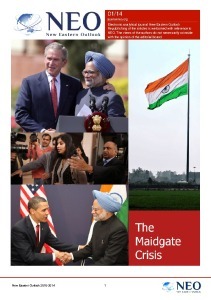 It is possible, that the incumbent US President will pursue his own interests all but exclusively. Both the short-term and the medium-term ones. The first category definitely includes the coming US Congress midterm elections that are due in autumn this year, and the second one has to do with his plans to get re-elected as US President in 2020. This may be concluded from the leaks from some “diplomatic circles” that there allegedly exists an arrangement between the US, Japan and South Korea to get North Korea to “completely and verifiably” abandon its nuclear weapons “by summer 2020”. However, the real topics for the US-North Korean top-level discussion (“in late May – early June”) can hardly be known in full even to the US closest allies. Probably, the only “bargain” Shinzō Abe really managed to get from Donald Trump is the latter’s pledge to raise the issue of those 10-20 Japanese “abducted” by North Korean special forces in the 1970s. That is not much, to tell the truth. As for the bilateral trade and economic relations, the result of the latest negotiations between Shinzō Abe and Donald Trump does not show any reduced distance between their original points of view regarding both the old and the new problems. The latter includes, for instance, the US administration’s intention to impose additional duties on the imported steel and aluminium. Japan will be among the countries primarily affected by this measure. The ongoing US-Japan trade deficit remains the biggest issue. In 2016, it amounted to $ 55 billion with the total trade volume of $ 270 billion. In fact, “unfair trade” is what all Donald Trump’s dissatisfaction with allies, friends and opponents is about. This is also the reason behind the latest protectionist move by Washington. According to Donald Trump, the best way to resolve the issues in the US-Japan relations is to sign a bilateral free trade agreement. The Japanese government, in its turn, prefers (as proven by the Mar-a-Lago negotiations) the multilateral Comprehensive and Progressive Agreement for the Trans-Pacific Partnership (CPTPP), signed by 11 countries in Chile on March 8. Let us remind you that this is the very agreement the US withdrew from in early 2017 by Donald Trump’s decision. The US President recently stated (not very clearly, though) that there is a possibility for the US’ return to the CPTPP, “provided that the US is given acceptable conditions”. All the 11 CPTPP member states are in favour of the US return, taking into account the enormous US market they can potentially sell their goods on. But what are the “conditions” the US wants? This would have been easier to discuss before the final CPTPP document was signed. Now that it was, everything is going to be much more difficult, as Shinzō Abe indicated. Actually, the Mar-a-Lago negotiations confirmed the fundamental differences between the strategies of the first and the third world economies. If Donald Trump is still keeping (with his unclear reservations) the policy of “economic egotism”, then the Shinzō Abe administration is very determined to use multilateral foreign economic relations formats. This approach may enable Japan to find common ground with its main political opponent China, which not only encourages the globalization trend in today’s economy, but also expressed its intention to take the lead in it. The 4th China-Japan High-level Economic Dialogue between the delegations headed by the Japanese and the Chinese foreign secretaries (which took place on April 16 this year after an 8-year break) was an important sign of the bilateral effort on resolving the existing issues in the China-Japan relations. During the negotiations, it was emphasized that the 40th anniversary of the China-Japan relations saw a “historically favourable atmosphere”. Judging by the Xinhua agency’s article, the discussion between the two countries went far beyond the limit of purely economic issues and touched upon the whole system of their bilateral relations, as well as the political situation in the region. It seems that conducting (or, rather, restoring) the aforementioned Dialogue between Japan and China two days before the meeting of Shinzō Abe and Donald Trump became an unequivocal message sent to Washington by the two countries. The latter is thus given to understand that the APAC has a ponderable alternative to the world’s leading superpower dictating the rules of the game not only to its main geopolitical opponent, but also to its key ally. As for the results of the regular (6th by count) US-Japanese summit, it is hardly possible that the Japanese Prime Minister has a better idea of the US President’s position on the aforementioned issues. But then, it is doubtful that Washington has a clear idea of it either. Therefore, it remains for one to watch the future moves of the key players in the game that is taking place in the APAC as a whole and on the Korean peninsula in particular.